Blessed is She – Page 4 – Because the most meaningful blessings don't always come wrapped in extravagant packages and dazzling bows but in the midst of the brokenness, the messy, and the unintended journey. Because the most meaningful blessings don't always come wrapped in extravagant packages and dazzling bows but in the midst of the brokenness, the messy, and the unintended journey. When we find ourselves in the midst of unwanted circumstances that are distressing and beyond our control…we have a choice to make. We can miserably continue to fight it, attempt to fix it or even cowardly deny it. The best choice is to simply embrace it, placing our hope, expectations and confidence in Almighty God. Our prayer then becomes “not my will, but Thine be done”! It is in THAT place of abandon where we will find and experience God’s sufficient and precise Grace, HIS overcoming strength and HIS power to endure in a whole new way. Our God is so good! It has been just short of two years since my divorce. For the first year and a half, thinking about entering into a new relationship has had no appeal. Instead, I lived with an intentional guarded heart as I poured my time and energy into my children and in the quiet moments, gleaning over all that had previously transpired. It was a precious season of healing and blessings in spite of the many court dates, the attorney fees, the forced bravery and the utter unbelievable craziness that had unfolded. However, within this defining journey, came the realization of how very distracted my mind had been throughout the longevity of my marriage, by the way, which never served me nor my children well. I could easily say this became an idol in my life, an all consuming thief of my emotional energy and time. I was overly occupied with fighting for my marriage and for my husband. This is not a bad thing…for a season. However, being on this side of that battle shows me that I was fighting a war I would never win without losing myself in the process. I am not talking about the lose-yourself-like-Jesus-sacrificial way but the lose-yourself-like-your-heart-doesn’t-matter kind of way. Yet, I was determined. Many of my days consisted of feeling overwhelmed and anxious about doing all I could to keep my family together while dealing with my own personal brokenness and pain. I had learned to wear the mask well and hide my messy self behind my stubborn faith and relentless hope that things would get better. However, I know in my heart that my preoccupation with my, then husband, and his issues is what occupied a huge space in my thoughts and with my actions. It is interesting and yet, sad to me how we can learn to live with brokenness and weeping wounds, for YEARS for the sake of marriage, children, reputation, and what you think is the “biblical” way for those who claim to follow Jesus. The pain is always there no matter how hard you try to pray it away. However, God is so faithful! He is right there with you in the middle of your mess. He is so very gracious to His daughters whose only desire was to grow up, get married, have children and live their happily ever after. Am I the only one? I don’t think so! Maybe you are reading this right now, and you can relate. I can tell you, my God never left me. His sweet presence enabled me to rise, if only my head at times, from the pit that had become so familiar in a twisted yet comfortable way and I am utterly thankful! He saw every gut wrenching tear and I am wholly confident that He even divinely protected my heart from things that I still to this day, do not know a thing about. AND, I am okay with not knowing. I know enough. Exposing lies and secrets became my dreaded challenge time and time again. However, the uncovering of hurtful things never got easier, never. My prayers for my, then husband, and our marriage were not answered the way I, and so many others had prayed and hoped, and I am okay with that now, too. He had his issues and I had mine. We were both broken, just broken differently. By God’s undeserved and extravagant grace, He rescued me. The lie that I had held close for so long was gently and unashamedly exposed. To let go of my marriage was not, by no means, giving up on God NOR my faith. It was quite the opposite. Trusting that my God had brought me through only to lead me out took MORE bravery and MORE courage and challenged my faith way beyond what this girl could ever muster. Instead of gaining a healthy marriage, I gained something so much more than I even have words to express. I gained Christ. Yes, I know… I was His daughter throughout but I have undeniably experienced a deeper level of his amazing grace, his presence, his love, his strength, his faithfulness, and his blessings like I had never experienced before. All this in the midst of my broken, unpredictable and unintended journey. That to me, is worth SO much more than answered prayers. What I have experienced is something that no earthly relationship can ever compare to, at least that’s my broken girl story, for now. I am not shameful of who I was all those years, at least not now. I have worked through the shame that tried to attach itself to me in my brokenness. You see, I know I tried. I tried REALLY hard to be the best wife I could be and the best mom I could be. I endeavored to do everything I could to fix us, to fix him (this is NOT recommended, you can only fix yourself), to make it better, to hide the hurt and to survive. I was not at all perfect nor was I a “holier than thou” kind of wife. I had my sins, my struggles, and my shattered heart that wanted control so that I would not get hurt, again. I have realized that is what fueled my selfish stubbornness, at times. I own it. AND I have released it, forgiven by my Father whose extravagant love for me overshadows the broken girl that I have been. If not for the grace of God, where would I be? Subsequently, the first year following my divorce I found freedom. Freedom to be the mom I had always longed to be buried beneath the insecurities, the confirmed suspicions and a wounded heart. My kids captured my complete attention. They are who I built my life around. Them and Jesus. We needed each other. They needed to know by my priorities that they had someone in their corner. Someone that they could depend on. Someone who would love them, invest in them, and love them unconditionally. And I needed to know that I could do this single mom thing with the Lord up girding me, day in and day out. Life as we knew it had forever changed; new home, new school, new job, new friends, and only the three of us. And yet, our faith was our constant companion. Our God never changes even when we feel ripped to shreds in the confines of the crazy and the messy. Even when our heads were bent low attempting to escape the new labels and scary statistics that the world threw at us. By the way, have you seen them lately? Well, don’t seek them out if you are a divorced parent….your kids don’t stand a chance from what I have read. BUT GOD is all I can say to that!!! HE IS BIGGER!!! Amen? Since then, we have pushed through, we have stood together, strong though broken. We have experienced God’s sweetest blessings through the relentless support of family, faithful friends, church family and Pastors. We have proven that life can go on after such brokenness and that we can even laugh, smile, and enjoy our space again. The beauty of God in our midst is the light that has invited confident hope in the darkest places of our hearts. It has not been easy. I will not candy coat any of it. There has been more hard stuff and more brokenness to walk through that caught me blind sided. That. is. life. My “word” for 2017 was surrender and that is exactly what I had to do time and time again. Hitting the carpet in abandoned surrender was truly my survival arsenal. AND yet, again, God has been so faithful. HE has been our Anchor that has held us steady through the most horrific storms. I am abundantly thankful! A new season is within reach! I am looking forward to the future God has for me and for my children with expectancy and anticipation and maybe, just maybe I will find love again and if not, that’s okay, too! My God is faithful! My God is enough! I am one blessed girl that has learned that trusting God does not always mean our marriages will be saved or our journey will look like what we had desired or even prayed for. What about you? Has your life taken you on an unintended journey? Have there been gut-wrenching prayers that seemed to go unnoticed and unanswered? Sweet sister, God has heard every single one! You and I can be fully confident that our loving and gracious Father is creating beauty from our ashes, purpose from our pain and preparing us for our eternal ever after! So be it, Lord! What do you do when your loved one’s heart seems to be hardening towards God and towards you? Maybe, your marriage was previously redeemed from brokenness and betrayal but now you are seeing red flags that indicate things may be going south again. How do you relate to your spouse without being consumed with trying to rescue them and save your marriage in the process? It’s tough! The following is just some thoughts with regards to what I have concluded from my own journey. Sometimes it is more HURTFUL than USEFUL to try to speak TRUTH and have an intimate conversation or confrontation with someone you love who’s heart is hardened. This is especially true if you are hoping for a certain response that would give you some indication that their heart is softening. Please don’t tell me I am the only one who has done this?? You want hope. You want to see a glimmer of evidence that it’s not as bad as you think it is. You do not want to get hurt again by the same destructive patterns that you have experienced in the past. Without being led by the Holy Spirit, you are setting yourself up for discouragement and even despair. Many times they will care more about giving you their opinions than taking into account your feelings. Friend, when God is leading you, He will give you peace no matter the outcome of the conversation. You will be able to share your heart and then be assured that you have did what He laid upon your heart and can trust Him for the future outcome. Even though your deepest desire is to see them grow towards Christ and your heart is broken by their unloving/selfish attitude and choices, your best response is to LOVE them AS THEY ARE (as Christ has loved you) and continue to PRAY for them. Unfortunately, you can’t expect them to receive truth from you if they are actively running from THE ONE who IS TRUTH. YOU can’t change them, fix them, or make their choices for them. I understand how incredibly hard this is, especially in marriage. The truth is, true love gives freedom not control, manipulation or punishment. The choices they are making may lead to costly consequences and even the demise of your marriage but that is their choice to make. Subsequently, these consequences may be the very thing God uses to draw them back to Him. Friend, until there is a Divine heart change, your words may only push them farther away. Be very careful and pray for God’s wisdom. He will lead you as to when to speak and what to speak and what actions to take, if necessary. Until then, avoid hurtful conversations and simply guard your own heart and leave theirs to God. This is where “let go and let God” becomes more than just a good quote but love in action. May you find comfort in KNOWING God hears your prayers! In ONE sudden moment HIS LOVE can change even the hardest of hearts! HE is able! TRUST Him! BELIEVE He is working beyond what you see! My hope is that one day you will find that it is truly a BEAUTIFUL thing to witness the transforming power of God’s amazing grace as YOU have a front row seat! No matter what, you can be assured that just as HE is working in their heart, he is working in YOUR heart, as well. You can trust God to help you handle the outcome even if it is not the desired outcome your heart longs for. Continually surrendering our loved ones to JESUS is not easy but painfully stretches our faith towards maturity that wasn’t there before. Though it may be hard to see now, your growth in Christ is priceless and purposeful. Embrace it and never stop believing! Our God is FAITHFUL! God, your God will cut away the thick calluses on your hearts and your children’s hearts freeing you to love God, your God with your whole heart and soul and live, really live. “A fool finds no pleasure in understanding but delights in airing his own opinions” (Pr. 18:2). I keep asking that the God of our Lord Jesus Christ, the Glorious Father, may give you the spirit of wisdom and revelation so that you may know Him better. And I (God) will give you a new heart—I will give you new and right desires—and put a new spirit within you. I will take out your stony hearts of sin and give you new hearts of love. Questions to ponder….Is Jesus ENOUGH for you? Can you simply TRUST HIM and be at peace? Can you just be content right now, right where your at, in THIS place, EVEN IF nothing changes this side of heaven? Will you BELIEVE his WORD is true for YOU!! So many times we say we trust and we say we believe. We sing about God’s faithfulness and declare that HE IS ABLE and yet we walk around FULL of worry, fear, anxiety, doubt, and discouragement. That is NOT the fruit of trusting and believing!! SO let me ask…What if what you are praying for does not come to pass this side of heaven? OR what if the thing that you fear happening actually happens…. (the things we worry about usually don’t occur but just go there with me for a moment). What then? Can you trust that GOD is STILL in control? Will you believe that HIS love for YOU never changes even though your circumstances do? Will you trust HIS ways when you can’t always understand? Instead of trying to pray away your difficult season, embrace YOUR place! Open your eyes and your heart to what God may be trying to teach you. Challenges can be blessings in disguise because they are opportunities for growth and teachable moments that would have otherwise been missed! SOME things simply can’t be taught by books or sermons but by REAL life, pain in the gut, keep breathing, keep moving, keep holding onto Jesus kind of days! Consider this…. God has already demonstrated how extravagantly He loves YOU by sending Jesus to REDEEM you! However, HE didn’t stop there…He then gave you the gift of the Holy Spirit to fill you with ALL that you would need in order to live out the God-given plans and purposes HE has ordained specifically for YOU! If HE never answered another prayer, is THAT enough? This journey is NOT an easy one but it IS a temporary one!! Don’t wait for things or people to change to embrace the LIFE, JOY and PEACE that is yours. You go, you grow, you shine brightly right where you are!! IN Christ, no matter what kind of mess surrounds you there are mercies to uphold you!! WHATEVER you may be facing, it is only a small chapter of a much BIGGER story that goes way beyond the here and now. Friend, EMBRACE YOUR PLACE in Christ! This very day is a gift and God has a PURPOSE in giving it to YOU!! Yes, even if it IS a tough day, a painful day, or a bad hair day…our Jesus is ENOUGH! Sister, do you desire righteousness to be credited to you as it was with Abraham? Can I encourage you for a moment? Today and everyday choose to BELIEVE God’s Word in spite of how you feel or what is coming against you. Respond to life with belief in God’s promises as your anchor. This means that no matter what you see before you, what unforeseen or unintended circumstance is staring you in the face, no matter what has broken your heart, you will BELIEVE God and walk in confidence knowing that He is the ultimate promise keeper! I KNOW this is NOT easy but GROWTH never is! Be brave and do it any way and experience the peace and faithfulness of our God! Will you be a woman of FAITH and COURAGE and pray this prayer with me? Lord, Help me to continually BELIEVE as Abraham believed and GROW strong and be empowered by FAITH as I praise and give glory to YOU! May I be fully satisfied and assured that YOU ARE ABLE to keep your Word and to do what you have promised. Lord, help me to embrace these growing pains as I surrender my mess and tenaciously choose to BELIEVE your Word above all!!! No unbelief or distrust made him waver (doubtingly question) concerning the promise of God, but he grew strong and was empowered by faith as he gave praise and glory to God, fully satisfied and assured that God was able and mighty to keep His word and to do what He had promised. That is why his faith was credited to him as righteousness (right standing with God). But the words, it was credited to him were written not for his sake alone, but they were written for our sakes too. Righteousness will be granted and credited to us also who believe in (trust in, adhere to, and rely on) God, Who raised Jesus our Lord from the dead. Author minadamsPosted on January 16, 2018 March 9, 2018 Tags Be Brave, Believe, courage, faith, Sisters in Christ, Word of GodLeave a comment on Believe! I have read this scripture many times focusing on how God is the potter and we are the clay. 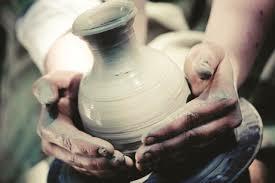 Meditating on the profound encouragement that comes from surrendering our lives on the potter’s wheel, knowing that He will mold us, flaws and all, into what He has created and purposed for us to be. However, this season of my life I noticed something that jumped off the page at me. “And the vessel that He made of clay was BROKEN in the hand of the Potter..” There it was, it stung but with such sweet and intimate comfort. Why? Because I was the broken vessel. Yet, HE was holding me, His broken daughter. Oh, how I so needed this. So simple, yet so comforting. I cried, but this time it was with tears of undone abandon. In that moment, I knew He was with me, HOLDING me, and ministering to my broken self beyond what I could even comprehend. So dear sister, no matter what has left you broken, you can be assured that you, too, are being tenderly HELD by the loving Potter, Himself! He created you! He is your Redeemer! He will not reject you, nor toss you aside. Your brokenness is no match for His expertise in making all things new! He has a plan to redeem you and take your brokenness and create beauty that wasn’t there before! Believe it! Our God is faithful! Psalm 130:3-4 If you, Lord, kept a record of sins, Lord, who could stand? But with you there is forgiveness, so that we can, with reverence, serve you. Everyday I fall short, but so thankful that God NEVER nor will He EVER give up on me! His love and grace is such a beautiful gift! It’s a gift for ALL of us that we get to open every day! Just because we fail and falter does not mean we are disqualified from the plans and purposes He has for us. Thank you, Jesus!!! No, His forgiveness enables us to rise up from our mess, our mistakes, our failures and move forward to do what He has called us to do!! Receive His gift to you today with JOY AND re-gift it to others! Our God is GREAT! Blessed is She Blog at WordPress.com.